^ Foltz, Frederick (1903). 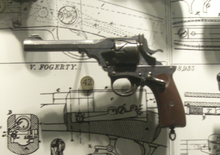 "Webley-Fosbery Revolver". In Rodenbough (ed.). Journal of the Military Service Institution. 23. [[Military Service Institution of the United States]]. pp. 434–436.